What is Google AdWords and PPC? Google AdWords is Google’s PPC (pay-per-click) search engine advertising program. It is not the only one, but it is the largest and probably most renowned. In this post we’ll examine why search engine advertising can be a really effective marketing tool for small businesses and should be included in your search engine marketing strategy. We’ll also focus on why tracking your PPC campaigns and their ROI is important. Basically, search engine marketing comprises of two key tools – non-paid Search Engine Optimisation (SEO) and paid PPC search engine advertising. SEO focuses on content and involves the ongoing process of on-page optimisation, key-phrase analysis and link building. These help improve your businesses ranking within the natural / organic listings in the search engine results pages (SERPS). PPC on the other hand, is a paid approach that involves you advertising your business at the top and to the right of relevant search engine pages through identifying the keywords appropriate to your business and placing bids on those keywords. On each click-through from your advertisement you pay a pre-agreed amount to Google. Benefits of Google AdWords to small businesses and start-ups. SEO and PPC both have their own advantages and disadvantages and you don’t have to use one or the other in isolation. In fact, to make the most out of your search engine marketing you should use a combination of both SEO and PPC – that way you’ll maximise the amount of traffic coming through to your site. As a rough guide about two-thirds of visitors click-through via a natural listing and a third through PPC – which is still a significant amount of traffic that you can’t afford to ignore. Cost control: You can manage and control your budget through capping your spend. Plus, you are only paying when a user actually clicks through to your site. Quicker visibility: SEO offers longer-term and sustained rankings, but for a small business it can take a fair amount of time and lots of hard work to move up the search engine rankings. Whilst you are working on improving your natural listings, PPC can be great way to get your business in front of your target audience quickly. Immediacy: you can get your advertisement up on SERP’s (Search Engine Results Pages) within hours – which is great if you need to get a promotion out quickly or indeed need to react to some unexpected competitor activity. Keyword bidding: Through higher keyword bidding against a competitor your ad can achieve a higher ranking. Effective monitoring: Google AdWords tracking script enables you to closely monitor the success of your PPC campaigns. Brand Awareness: Even if visitors do not click through to your advertisement, you are still building awareness of your brand amongst your target audience. Once you’ve signed up to Google AdWords, your first starting point is Google Keyword Planner. This will enable you to research relevant keywords, help generate keyword ideas and get search volume statistics and traffic estimates, all of which will help you decide which keywords to use and what budget to set. Remember though, the most popular keywords (the ones that generate the most traffic) will have the highest competition and will therefore require more budget. So spend some time looking for what’s known as ‘long-tail’ keywords. These are longer, more targeted keyword phrases that often have lower competition (as they generate less search volume) and consequently lower costs. Crucially though they often have a higher conversion rate giving you a better ROI. To get the most out PPC you will need to do a fair amount of tweaking and testing of different keywords and phrases. And, don’t forget your landing page. You could have the greatest ad campaign in the world, but if your landing page is poor then any potential customer will leave immediately rather than converting into that all important sale. Spend time making your landing page effective in order to maximise your conversions. “The key to success in using any PPC service lies in the richness of keywords themselves as well as the continuous testing of ads” (Gay et al, Online Marketing). As with any other marketing, it is essential that you can monitor and analyse your campaigns. Having a deeper understanding of how specific keywords and campaigns have performed, means you will be able to focus your effort and channel your budget in the right direction, thus maximizing your ROI (Return on Investment). Google AdWords provides a tracking script that enables you to monitor all sorts of useful information that occurs after a customer clicks through from your advertisement. Tracking and analysing this information equips you with the knowledge you need to make decisions on where best to focus you efforts. You will know which of your campaigns were the most successful at bringing in business and then you can tweak or get rid of those that are underperforming. Tracking your Google AdWords campaign on your shopping cart’s order completion page. Conversion tracking through your order completed page is simple once you’ve set up you Google AdWords campaign. For example, with ShopIntegrator you can easily integrate the Google AdWords campaign tracking script at order completion. Google AdWords can then receive statistics from customers who have made a purchase from you and arrived at your site from your Google AdWords campaign. 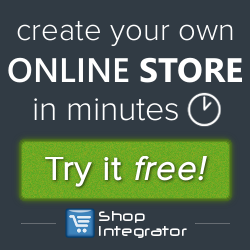 ShopIntegrator allows you to insert order specific statistics like order value into the Google AdWords tracking script that will enable Google AdWords campaign dashboard to show your cost per acquisition. Google AdWords is a great marketing tool for small businesses especially if you are looking at the wider picture of search engine marketing as a whole and using it in conjunction with SEO activities. Focus your initial efforts into keyword research incorporating long-tail keywords and phrases, optimising your landing page and tracking your performance. Remember creating successful ROI with PPC takes lots of testing and tweaking – so keep at it.